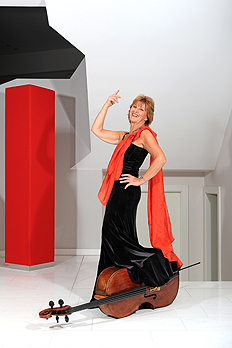 Maria Kliegel, cello, studied with János Starker at Indiana University in Bloomington, USA. Mstislav Rostropovich described her as La Cellissima: “The best cellist I have heard since Jacqueline du Pré.” She has won many first prizes in national and international cello competitions (including the American University Competition in Chicago, the German Music Competition in Bonn, the Aldo Parisot Competition in Brazil, and the Concours Rostropovich in Paris) and has made appearances as a soloist across the world. Her extensive repertoire has been recorded on both CD and video. With around one million CDs sold worldwide, Maria Kliegel is the market leader in the field of cello literature. Above all, she has made a name for herself through her untiring commitment to contemporary music, which includes world premieres and CD recordings of works by, among others, Alfred Schnittke and Sofia Gubaidulina as well as Wilhelm Kaiser-Lindemannʼs Hommage à Nelson Mandela. She has also been a jury member in many competitions and is known for her active involvement in music education. Since 1986 Maria Kliegel has been teaching a master class at the Cologne University of Music. In Schott Master Class Cello, her multimedia book and DVD project published in 2006, she explores completely new paths for learning how to play the instrument. The volume was awarded the Digita special prize for the best German educational software and the Comenius EduMedia seal in 2007. Since 2010 the label Naxos has been selling the English version Using Technique and Imagination to Achieve Artistic Expression worldwide. After almost three decades of brilliant and critically acclaimed productions for the label Naxos, with over 40 solo CDs and two Grammy nominations, this current album is a new production on the label GENUIN classics. Maria Kliegel plays a cello by Carlo Tononi, ca. 1730, Venice.